Closing at a 52-week high is a good sign when there is 40% upside. XRAY is fighting resistance at $50 but has room to run to reach the $70 highs from 2017. DENTSPLY SIRONA Inc. designs, develops, manufactures, and markets various dental and oral health products, and other consumable healthcare products primarily for the professional dental market worldwide. The company operates in two segments, Technologies & Equipment; and Consumables. Its dental supplies include endodontic instruments and materials, dental anesthetics, prophylaxis pastes, dental sealants, impression materials, restorative materials, tooth whiteners, and topical fluoride products; and small equipment products comprise dental hand pieces, intraoral curing light systems, dental diagnostic systems, and ultrasonic scalers and polishers. The company also offers dental laboratory products, such as dental prosthetics that include artificial teeth, precious metal dental alloys, dental ceramics, and crown and bridge materials. In addition, it provides dental technology products, including dental implants and related scanning equipment, treatment software, and orthodontic appliances for dental practitioners and specialist, and dental laboratories; and dental equipment, such as treatment centers, imaging equipment, and computer aided design and machining systems for dental practitioners and laboratories. Further, the company offers healthcare consumable products, such as urology catheters, medical drills, and other non-medical products. It markets and sells dental products through distributors, dealers, and importers to dentists, dental hygienists, dental assistants, dental laboratories, and dental schools; and urology products directly to patients, as well as through distributors to urologists, urology nurses, and general practitioners. The company was formerly known as DENTSPLY International Inc. and changed its name to DENTSPLY SIRONA Inc. in February 2016. DENTSPLY SIRONA Inc. was founded in 1899 and is headquartered in York, Pennsylvania. Company description from FinViz.com. XRAY was one of the three worst performing healthcare stocks in 2018. Things are looking up now that they are well into their restructuring program. The company reported earnings of 58 cents that beat estimates for 54 cents. Revenues of $1.06 billion beat estimates for $1.03 billion. Both metrics were down from the year ago quarter. However, the company projected for earnings to rise 15.5% in 2019 with revenue of $3.95-$4.05 billion, which beat estimates for $3.94 billion. They guided for 2019 earnings of $2.25-$2.40 with a midpoint of $2.32 that easily beat estimates for $2.15. Shares spiked sharply after the report and have traded sideways for the last month. There is an uptick in progress and Today's close was a 12-month high. 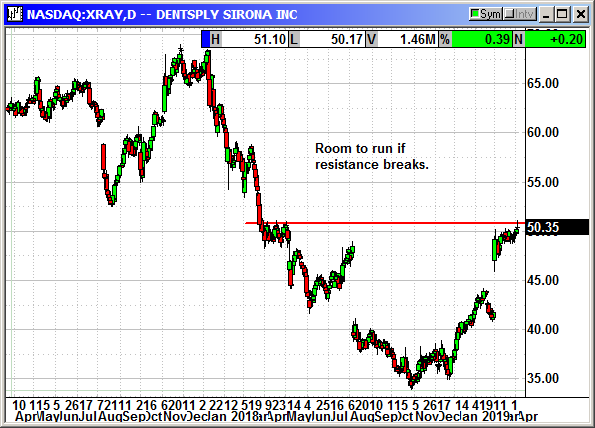 If XRAY can move over current resistance they have room to run. Buy July $55 call, currently $1.55, stop loss $48.50.